EghtesadOnline: Foreign Minister Mohammed Javad Zarif said Iran is willing to sign a deal with Iraq to drop customs tariffs between the two countries. "The Islamic Republic of Iran is prepared to eliminate tariff rates between the two countries," Zarif said, addressing an economic forum in Iraq's southern city of Karbala on Wednesday. Iraq is the biggest destination of non-oil Iranian products. Latest data released by the Islamic Republic of Iran Customs Administration show Iran’s exports to Iraq reached $6.92 billion to account for 20.77% of total exports during the period, according to Financial Tribune. Exports to Iraq increased by 48.7% compared with the same period of last year. As the second-largest source of imported goods in Iraq, Iran mainly exports liquefied gas, hydrocarbons, mineral products, fresh or frozen tomatoes and evaporative coolers to Iraq. Secretary-General of Iran-Iraq Chamber of Commerce Hamid Hosseini said as Iraq is beginning to rebuild the infrastructure destroyed by terrorists, a number of its cities, especially Mosul and Kirkuk, can become a suitable market for Iranian construction materials and foodstuff. "Iraq has six million displaced citizens, four million of whom have returned after Daesh was defeated. Iranian products can be the best option to provide for these people, but our share in the markets of Mosul and Kirkuk is relatively low at present and we need to increase it," he said. Zarif offered to allow Iraqi businesspeople to enter neighboring Iran without visas to increase duty-free zones. Recent data show Iraqis accounted for the largest group of foreigners who visited Iran during the seven months to Oct. 22. A total of 1,926,310 Iraqis visited Iran in the seven-month period, followed by 989,836 Azerbaijani, 557,579 Afghans, 483,302 Turks and 159,728 Pakistanis. This is while the number of tourists from Iraq stood at 1,356,185 in the last Iranian year (March 2017-18) and 1,398,201 in the year before (March 2016-17). Besides canned food and cars, Baghdad also buys 1,300 megawatts of electricity and 28 million cubic meters of natural gas daily from Iran to feed power plants. "Despite the US sanctions, Iran is exporting $2 billion worth of gas and electricity to Iraq annually," Zarif said, stressing that the two countries' cooperation in the energy sector can grow if Tehran and Baghdad decide not to allow Washington to impose restrictions on their trade. Iraq has told the US it needs Iranian electricity and natural gas, and can't find other sources as quickly as the US wants. It has asked for and received waivers for those imports. Iranian businesspeople say they're getting around the trade ban. "Let me tell you one thing. No problem. We will find it, same as that we have done last sanction," said Reza Nateqi, the manager of Solico, a major Iranian food conglomerate, as reported by Washington-based media organization National Public Radio. His company's products are available in almost every Baghdad supermarket. A company official says they employ 1,500 Iraqis at the food processing plant and distribution centers. Nateqi noted that the sanctions will slow their expansion, but won't stop it. In a trading office in Erbil, investment banker Shwan Ibrahim Taha says his firm, Rabee Securities, deals only with the legal banking system. But he says, in Iraq, that system is overshadowed by the thriving business in informal money transfers. "The unofficial banking system in Iraq is much bigger than the official banking system and is more capable, more agile," he said. Zarif said 80 Iranian technical and engineering companies are involved in Iraqi contracts worth $8 billion. "The Islamic Republic of Iran enjoys very high capacities to reconstruct the post-Islamic State Iraq. Iranian firms should have a key role in rebuilding Iraq after the fight against the group, he said. 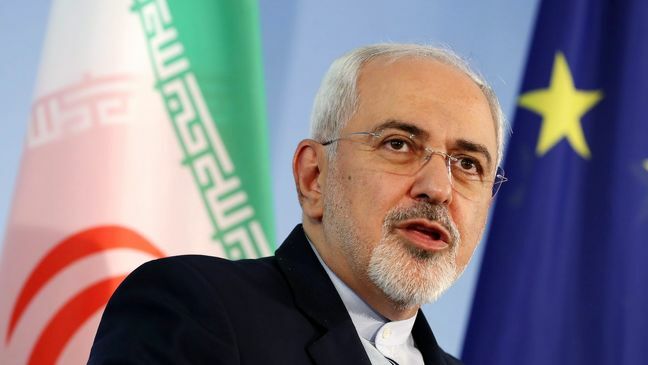 Zarif was referring to the self-styled Islamic State terrorist group. Now, as Iraq looks to rebuild, Zarif said Iranian firms should be favored because of his country's support and the complex logistics of partnering with Western companies. "If a European or American company comes to Iraq to do reconstruction activities, the costs of protecting their workers and staff in Iraq exceed its contract [value]," he said. But an Iranian company could help rebuild at "low cost" and without security concerns, after having "stood alongside the Hashd". Hashd refers to Popular Mobilization Forces, who consist of 2-3 million volunteers and militias operating under the Interior Ministry's Popular Mobilization Units Directorate. The battle to defeat IS ravaged swathes of Iraq and shattered its economy. Last year, Baghdad said its 10-year reconstruction plan will cost an estimated $88.2 billion. Zarif was speaking during his fourth day's visit to Iraq, where he has met top officials in Baghdad and the Kurdish city of Erbil, and attended a trade summit. The Iranian foreign minister commended Iraq's positive stance on the promotion of ties with Iran, saying the two countries have managed to foil US bids to sabotage mutual relations. "After (achieving) victory against the IS, some countries, including the US, have created problems in the way of the two countries' cooperation, but fortunately, they were defused thanks to the wisdom of the two countries' officials," he said. Zarif praised the Iraqi government's positive stance on unilateral sanctions imposed by the United States against the Iranian nation and noted that he planned to hold talks with senior officials of the Arab country on further boosting cooperation.